FairPlay founder Francois Baird has congratulated President Ramaphosa on his announcement to develop a stimulus package for economic growth and job creation. In a letter to the President, FairPlay draws attention to the possibilities presented by South Africa’s sugar and chicken industries. South Africa’s chicken and sugar industries are areas where the President’s stimulus package can support growth and create hundreds of thousands of new jobs, mainly in impoverished rural areas. The potential is huge. Both of these important and strategic industries are shrinking when they should be expanding and creating jobs. However, before this can happen, existing jobs need to be protected. This is another area where the stimulus package can make a valuable contribution to the employment prospects and support economic growth in poor rural areas. Trade support against imports is necessary for job protection. Industry support for diversification in the sugar and chicken industries is necessary for job creation. South Africa’s chicken industry could supply the local market. In addition to replacing the huge volumes of imported chicken pieces, local suppliers could also replace the hundreds of thousands of tons of mechanically deboned meat (MDM) currently imported from Brazil to supply processed meat manufacturers. A new local MDM industry would create new local jobs. 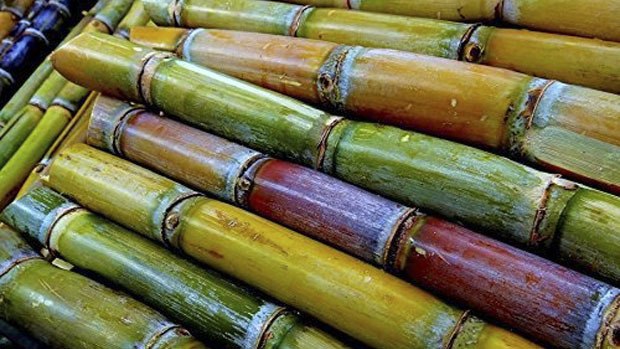 The sugar industry, too, could expand and create new jobs through diversification into fuel ethanol and the co-generation of electricity from sugar cane. An ethanol mix in our petrol would reduce our oil purchases while creating jobs in a new ethanol industry and in an expanded sugar industry. The sugar industry currently employs 85 000 people directly and supports some 350 000 jobs in related industries. The chicken industry currently employs 110 000 people directly and supports some 20 000 others in the grain industry. FairPlay maintains that the stimulus package could result in these two industries expanding to employ some 720 000 people. These workers would support between 4.3 million and 7.2 million people, most of them in poor areas in KwaZulu-Natal, Mpumalanga, Free State and other provinces. A key component of the FairPlay campaign to stop job-destroying predatory trade practices is to continually reach out to governments and their agencies, to foreign embassies and to international NGOs that focus on international trade anddevelopment. By engaging with these stakeholders FairPlay will inform, engage and mobilize support for rural workers in South Africa’s sugar and chicken industries who are seeing their livelihoods destroyed by dumping. Recently FairPlay has met with representatives of two European embassies and has engaged with international NGOs that have fought against EU dumping in Cameroon and elsewhere. In addition to this international outreach FairPlay meets regularly with South African policy makers and officials. The FairPlay movement urges parliamentarians of all parties to support poor people and national nutrition by ensuring that Value Added Tax (VAT) is removed from chicken. The Woolard panel, which was commissioned to review the VAT-free basket and consider additional items that should be VAT zero-rated, could not reach aconsensus on chicken and has therefore deferred the issue to parliament. This is an issue of national importance, and FairPlay urges all MPs, and particularly those from the ruling party, to look after the interests of the poor. Chicken has become the staple food for the nation and is the major protein source for poor people. The government is looking for ways to lift the VAT burden from lowerincome households. There is no more effective way to do this than removing VAT from chicken. Trade union partners are very active and supportive of the FairPlay campaigns. 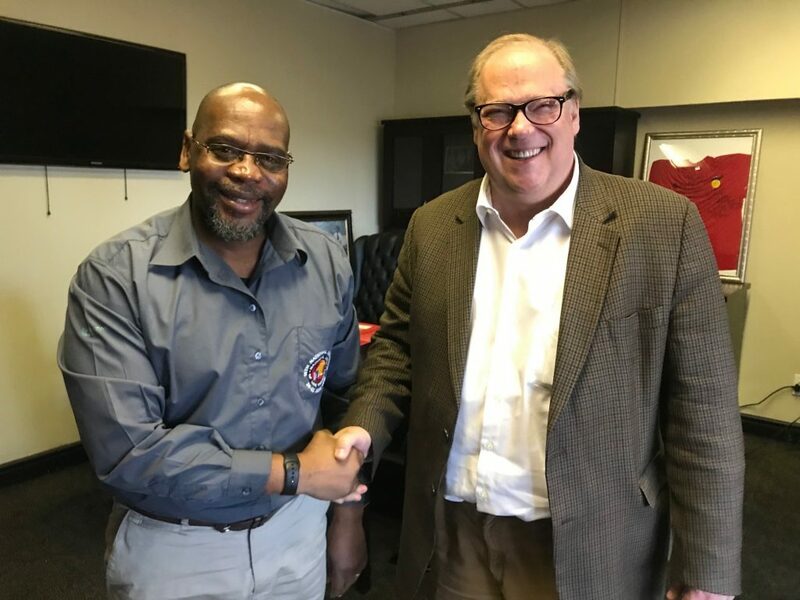 Recently Sdumo Dlamini, President of the Congress of South African Trade Unions (COSATU) met with FairPlay Founder Francois Baird (pictured above). COSATU pledged to further strengthen their cooperation with FairPlay. FairPlay’s other trade union partner, the Food and Allied Workers Union (FAWU), has long been active on FairPlay’s campaigns to support workers and to save jobs in the chicken and sugar industries. FAWU has consistently mobilized its membership to join in marches to stop dumping. The story of Cameroon’s poultry industry should be both a cautionary tale and an inspiring one for South Africa. If a country with far fewer resources could turn the tide on dumping, there is no reason why South Africa cannot and should not. In 1995, Cameroon became a member of the World Trade Organisation and acceded to the agreement on agriculture that capped import duties. This, combined with changing consumer patterns in Europe, had a far-reaching effect on the country’s poultry landscape. Farmers noticed the decline in business and raised the alarm, drawing attention to the fact that frozen chicken pieces had become available for the first time in Cameroon. Globalisation had opened Cameroon’s market without affording it any reasonable protection. But the people most affected were not about to roll over. In 2003, the civil-society organisation ACDIC (Civil Association for the Defence of Collective Interests) was founded and launched an advocacy campaign backed with powerful evidence. Laboratory studies had shown that a staggering 85% of the imported chicken pieces were not fit for human consumption – supporting anecdotal evidence of guests at weddings and funerals falling ill and even dying. Economists had calculated that the local economy was losing 300 billion Central African francs (about R7.5billion) a year to chicken imports – making it glaringly obvious that the problem was far greater than a few farmers losing their livelihoods. 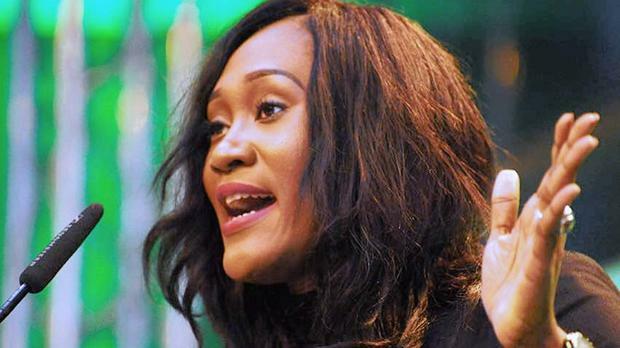 Yvonne Takang, spearheaded Cameroon’s successful fightback against the predatory trade practices that came close to destroying that country’s poultry industry. People such as Takang, who heard and responded to the farmers’ pleas, followed the trail of the frozen chicken to the ports. The culprits were revealed to be ships from the EU and South America. Further sleuthing identified Belgium, France and Germany as the main sources of the chicken pieces A hallmark of ACDIC’s modus operandi was to mobilise consumers and farmers, persuading them it was time to come together. “To succeed in such a campaign you have to touch everyone who feels the pain,” Takang says. The campaign’s first show of force was more than 5000 people protesting in the streets. In 2006, the campaign and Takang’s tenacity were rewarded when Cameroon obtained a ban on chicken imports. While it remains illegal to import chicken to Cameroon, the pressure is not off. The EU threatens now and again to force Cameroon to open its markets, given its status as a signatory to the Economic Partnership Agreement, and even from inside the country threats surface. A feature of Cameroon’s chicken market, following the campaign, is that consumers have become activists. They understand that the cheap chicken pieces are bad for their health and for the health of the country’s economy, and continue to demand local chicken. “The one thing you should know is that African economies rest on agriculture with a big A,” says Takang. “When that sector is affected, the country’s economy goes down. A recent story in the Daily News highlights a looming tragedy for South Africa sugar farmers. The sugar industry’s annual sales have declined by 27 % as a result of the Health Promotion Levy (HPL), commonly called the sugar tax, and imported sugar. According to Chris Fitzgerald, Illovo South Africa’s spokesperson, Illovo forecast a decrease in its sales to the beverage sector by at least 30%. The sugar producer also said that if the imports continued unabated against the backdrop of a recent two-year drought, farmers who had the ability to cultivate alternative crops would switch to other crops, while those who could not would simply go out of business. Fitzgerald said a recent independent report highlighted that the US sugar industry enjoyed industry subsidies estimated at 66% of the farm gate price, while the world’s largest sugar producer, Brazil, subsidised 27% of the farm gate price through a number of support instruments, including its fuel ethanol programme. “The South African sugar industry, which supports more than a million people through its activities, therefore needs protection from having to compete with the treasuries of other sugar producing countries. If imports continue, South Africa will continue to export jobs, and when South Africa stops growing sugarcane, it would put at risk many of its citizens relying on the sector for their livelihoods,” said Fitzgerald. 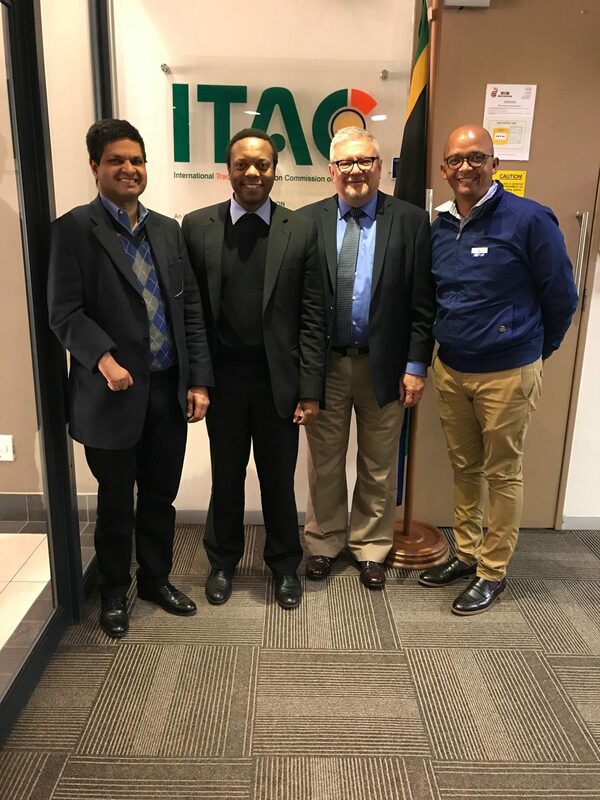 Following last month’s marches in Pretoria, where the industry advocated for an increase in the dollar-based reference price, it continued to engage with the government through the sugar value-chain task team on issues impacting sector viability, he said. In its integrated annual report, which Tongaat Hulett released last week, it said import protection in South Africa remained the lowest in the region. “In South Africa over several months, upward revisions to the import duty were not implemented timeously, followed by a period when zero duty was erroneously applied. As a result, some 520 000 tons of imported sugar entered South Africa and eroded local sales volumes by a third,” the report said.